The last time I read one of Nora Roberts' trilogies, I went back and picked up an earlier one set in Ireland. Born in Fire is the first in the Irish Born Trilogy. This one brings the Irish lilt and magic to life. Margaret Mary Concannon is a glass artist who sells her glass under the name M.M. Concannon from her small shop in County Clare. Her father, Tom, sent her to Venice to learn, despite the angry opposition of her mother. Maggie returned and built her own studio, and she's determined to pay back every penny so her mother can no longer gripe and moan about it. It's that determination that forces her to strike a bargain with Rogan Sweeney. Five years after her father's death, Sweeney, owner of Worldwide Galleries, tracks Maggie down. He's equally determined. He wants Maggie's work exclusively for his gallery because he has a dream of showcasing Irish artists. He wants to make Maggie into Worldwide's first native Irish star. But, the two have a volatile relationship from the very beginning. She's angry she has to work for money instead of love. But, she's also determined to make money to buy her mother a house so she'll leave Maggie's younger sister, Brianna, to run her dreamed of bed-and-breakfast without the constant demands on Brianna's time. And, no matter what Maggie does, she knows she'll never change her mother, a bitter woman who was stuck in a loveless marriage. It's that bitterness and sad marriage that makes Maggie fight Rogan every step of the way in their evolving relationship. As always, Nora Roberts creates unusual, strong characters. Her female characters are always independent and beautiful. Her male ones are always strong and handsome. A little bit unrealistic? Yes, but it's the individuality of their characters, and the independence that always stands out in these books. And, in the Irish Born series, there's an additional attraction. Ireland is depicted as beautiful in all varieties of weather, the sun and storms. The B&B, the pubs, the music, the landscape, all come to life with Roberts' careful words. Born in Fire is a delightful book of art and passion and Ireland. 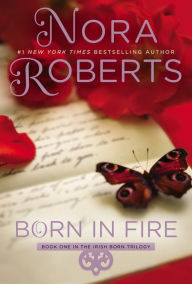 Born in Fire by Nora Roberts. Berkley Books. 9780425266090 (paperback), 337p. FTC Full Disclosure - I bought a copy of this book. I've always found Nora Roberts' trilogies, especially the ones with a little magic, to be her best work. Of course, the MacGregor series must be included. I love love love Nora Roberts. I especially love her trilogies and think this is still one of her very best. And the first in this series remains one of my all-time faves.